Emotional images of the looting of a Maya temple. 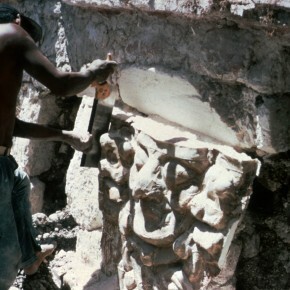 This is the looting of a large Maya stucco facade from the site of Placeres. It is a well known piece: not only is is now in the national museum in Mexico City, it is the standard image that you see on any wikipedia entry concerning the Maya (at least at the time I am writing this). And now, there it is, being sawed off a temple. Now the emotions. I was very excited to have access to these photos. A guilty sort of excited. Maybe a sober excited? This is your standard ‘understand the past to understand where we are now’. A history (or an archaeology) of the looting of cultural objects as seen through the remains. In this limited case, I was able to look into an idea presented in an article in Mexicon. The author speculates that two stucco masks in private collections may have come from the same source as this facade. The looting photos show that, at the very least, they didn’t com from this EXACT facade. Same site, perhaps, but not this facade. There are missing masks on the edges in the looting photos, but not the same ones. Nothing much, but interesting enough. In the broader sense, we have emotions again. Publication of these images makes what happened in the Peten real. As somehow who has spent some time in looters trenches in that part of the world, seeing ‘action shots’ is somehow more…just more. Sorry to end on such a fluffy note. I think they are only the tip of the ice burg. I think there are many collections like this out there and I think that they should see the light of day. I sincerely hope to we can gather more of this. If you have anything for us, let me know.